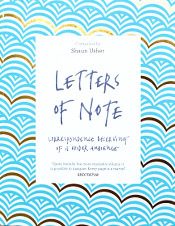 Letters of Note: Whatever you like doing, do it! Whatever you like doing, do it! 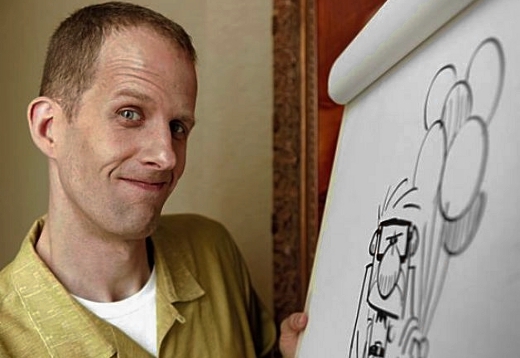 Since joining Pixar 22 years ago, award-winning animator Pete Docter has been influential in bringing some of the studio's most successful movies to the big screen, including Toy Story, Toy Story 2, Monsters, Inc., and Up — the last two of which he also directed. 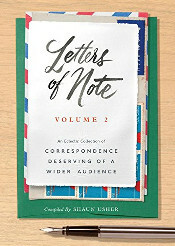 In 2009, Martin Kelsey — a teacher at South Valley Middle School in Liberty — wrote to Docter and asked for some advice to pass on to his students. His generous, encouraging response can be read below. Transcript follows. 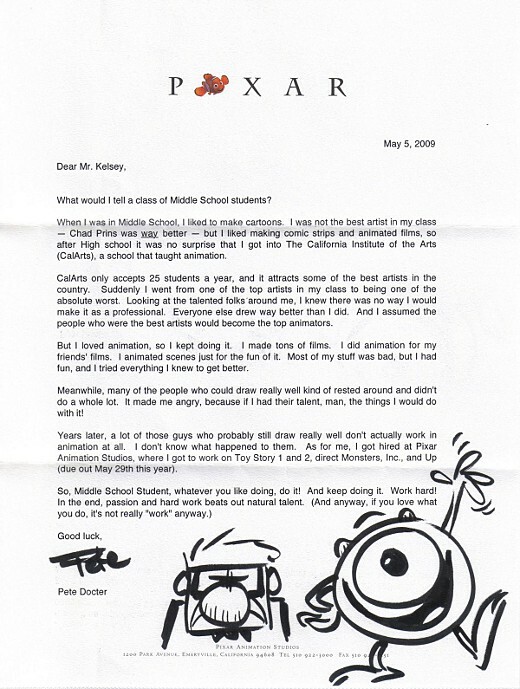 Also of note: Pete Docter's handwritten letter to a fan in 2008. What would I tell a class of Middle School students? When I was in Middle School, I liked to make cartoons. I was not the best artist in my class — Chad Prins was way better — but I liked making comic strips and animated films, so after High school it was no surprise that I got into The California Institute of the Arts (CalArts), a school that taught animation. But I loved animation, so I kept doing it. I made tons of films. I did animation for my friends' films. I animated scenes just for the fun of it. Most of my stuff was bad, but I had fun, and I tried everything I knew to get better. Meanwhile, many of the people who could draw really well kind of rested around and didn't do a whole lot. It made me angry, because if I had their talent, man, the things I would do with it! Years later, a lot of those guys who probably still draw really well don't actually work in animation at all. I don't know what happened to them. As for me, I got hired at Pixar Animation Studios, where I got to work on Toy Story 1 and 2, direct Monsters, Inc., and Up (due out May 29th this year).